More than a century ago, Carhartt workwear & apparel was revolutionized with the toughest materials available: denim and brown duck fabric. 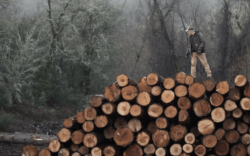 Today Carhartt brings its rugged-as-all-outdoors construction to everything from moisture-wicking T-shirts and arctic-quality outerwear, to socks and hats. As new generations keep discovering this legendary brand, Carhartt continues setting the standard for comfort and durability both on and off the job. Find the full line of Carhartt workwear & apparel at our Springfield and South Burlington locations! Hamilton Carhartt was born in 1855 in Macedon Lock, New York. He grew up in Southern Michigan and his entrepreneurial style was reflected in the modifying of his last name by adding an extra “t” to ensure he would stand out from other businessmen. He initially established a furnishing business which would continue to drive his ambition to succeed and lead him to create his own products. With some helpful advice from his first potential buyer, he realized his products had to be different. After talking with a railroad engineer, he created an overall garment specifically for the railroad worker which had never been made before. Hamilton Carhartt founded his namesake company in 1889 and began making work wear with a single goal in mind: Set a standard of excellence to which all others would aspire. Starting with only 4 sewing machines and about 5 employees, the first products manufactured were overalls in duck and denim fabrics. By traveling from town to town and visiting each railroad division, he was able to establish himself in the overall business. With entrepreneurial vision and determination, Hamilton Carhartt established a brand that has stood the test of time. The Great Depression had a devastating effect on Carhartt resulting in only three plants remaining in the U.S. after 1930. Hamilton and his son Wylie established the “Back to the Land” campaign leading to the joint opening of the Irvine, Kentucky operations with the towns people of Irvine. Carhartt’s Manufacturing Administrative offices are still located in Irvine, Kentucky today. We grew throughout the early 1900’s establishing more than 17 plants and three mills throughout the United States, Canada, and Europe. “From the mill to millions” was our motto and was reflected in our operations which included cotton production, denim mills and apparel manufacturing facilities. Carhartt Master Cloth was designed and woven especially by our mills for use in Carhartt garments and was pledged to be the best cloth that could be produced.